https://www.intrepidtravel.de/indien/kathmandu-to-delhi-2 60191 Kathmandu to Delhi https://www.intrepidtravel.de/wp-content/uploads/2016/12/8804460003358.jpg https://www.intrepidtravel.de/wp-content/uploads/2017/11/8808809332766.gif 1125 EUR InStock 15 /asien//indien//nepal//explorer//original/	Begebe Dich auf ein Abenteuer durch Nepal und Indien und entdecke die vielfältie Tierwelt an den Ausläufen des Himalayas, sowie den heiligen Fluss Ganges und den Geburtsort des Buddha. Zwischen Kathmandu und Delhi trifst Du auf Pilger in Varanasi und besuchst den beeindruckenden Taj Mahal in Agra. Diese Reise ist ein Abenteuer, das alle Deine Sinne verzaubert und Dir die Möglichkeit gibt, Nepal und Indien auf authentische Art und Weise zu entdecken. Verliebe Dich in Nepal, Gebetsfahnen und Stupas in Kathmandu. Du musst Dir keinen Wecker stellen, auf dieser Reise wirst Du bei einer Segeltour auf dem Ganges bei Sonnenaufgang von ganz alleine wach. Dein Reisepass muss ein indisches Visum enthalten, damit Du die Reise antreten kannst. An Tag 7 überqueren wir die nepalesisch-indische Grenze. Indische E-Visas gelten nicht für die Einreise an Landesgrenzen. Dieser Trip beinhaltet das Reisen mit öffentlichen Verkehrsmitteln und einige lange Fahrtage, wie zum Beispiel an Tag 7, wenn wir von Lumbini nach Varanasi (ca. 10 Stunden) fahren oder eine Fahrt im Nachtzug an Tag 10 von Varansi nach Orchha (ca. 15 Stunden). Wenn Du etwas Geduld hast, wird die Reise wesentlich angenehmer sein. Lehne Dich während der Fahrten zurück, entspanne Dich und genieße die weiten Landschaften. Nepal und Nordindien können im Winter überraschend kalt werden, bitte packe also entsprechende Kleidung ein, damit Du nicht frierst. Langstrecken- und Nachtzüge können oft verspätet sein und gelegentlich wegen starken Nebels zwischen den Monaten Dezember und Februar abgesagt werden. 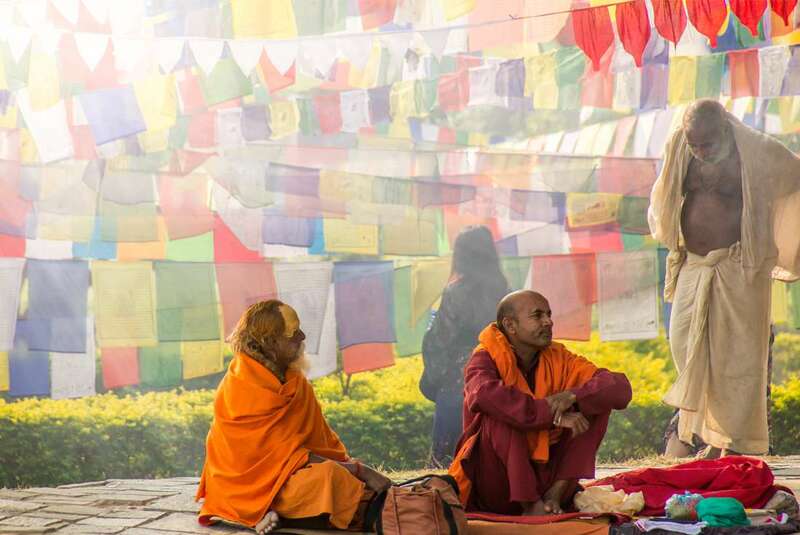 Embark on an adventure through Nepal and India, from the rich wildlife of the Himalayan foothills, across to the sacred River Ganges via the birthplace of Buddha. At key destinations between Kathmandu and Delhi witness pilgrims in Varanasi and visit the magnificent Taj Mahal of Agra. An adventure that will bring all your senses alive, this overland trip through Nepal and India is an incredible way to see the very best of the region. Namaste! Welcome to Kathmandu, where a mixture of ancient architecture, rich artistic and cultural heritage and proximity to the Himalayas have made it a legendary travel destination for decades. This adventure begins with a welcome meeting at 6 pm. Look for a note in the hotel lobby or ask the hotel reception where it will take place. If you’re going to be late, please inform the hotel reception. At the meeting, please have your insurance details and next of kin information ready to pass on to your leader. Once the formalities are out of the way, you can do as you please for the rest of the evening. Maybe grab your new mates and head out for your first taste of life in Nepal. 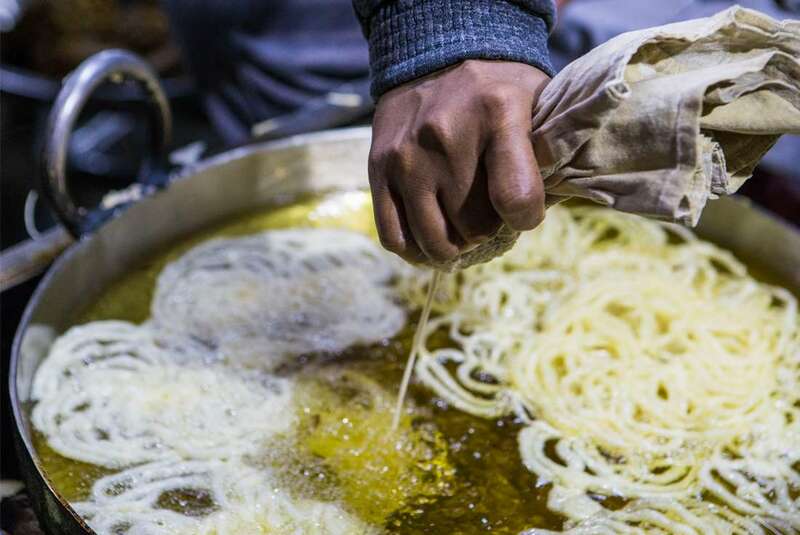 Your leader can give you the lowdown on where to find the best dal bhat (thick lentil soup). 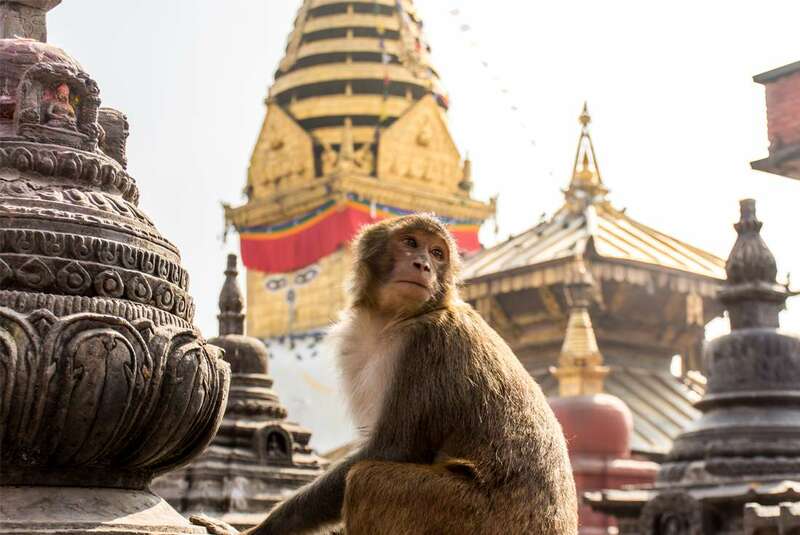 Start today with an excursion to Swayambhunath Temple – known to tourists as the Monkey Temple –Kathmandu’s most important Buddhist shrine. 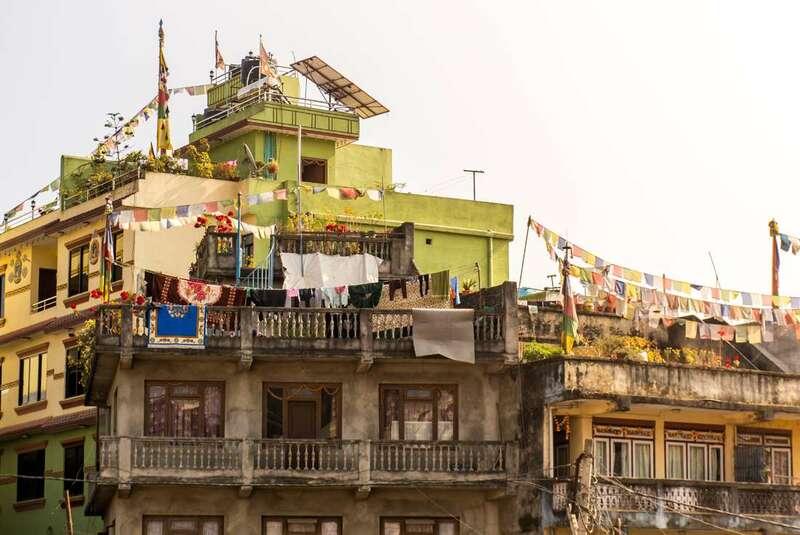 The sleepy, all-seeing eyes of the Buddha that gaze out over the city from their lofty perch have become the quintessential symbol of Nepal. Then, join the pilgrims at Bodhnath Stupa – the largest stupa in Nepal and the holiest Tibetan Buddhist temple outside Tibet. It’s the centre of Tibetan culture in Kathmandu and rich in Buddhist symbolism. Continue on to Pashupatinath, a sprawling Hindu temple comples on the banks of the Bagmati River in Deopatan. Dedicated to a manifestation of Shiva called Pashupati, the ‘Lord of Animals’, here you’ll see sheep, monkeys, pilgrims and holy men converging in this sacred space. The rest of the afternoon is free for you to explore further or take a breather, depending on how you’re feeling. This morning you’ll travel by private vehicle to Chitwan National Park, which sits at the base of the Himalayas around six hours away from Kathmandu. Declared the area a World Heritage site in 1984, this park and it offers some of the best wildlife viewing in Asia, with rhino, deer, monkeys and a wide array of bird life all regularly spotted by visitors. Arrive and settle in to your accommodation before jumping on a bike to explore a local village. In the evening, prepare for tomorrow’s exploration of the park with a presentation on the park’s history, flora and fauna. Today after breakfast, take a walk to the Rapti River from where you’ll be taken by boat on safari. Brilliantly coloured birds abound along the Rapti River, which also shelters about a quarter of the world’s remaining gharial population. 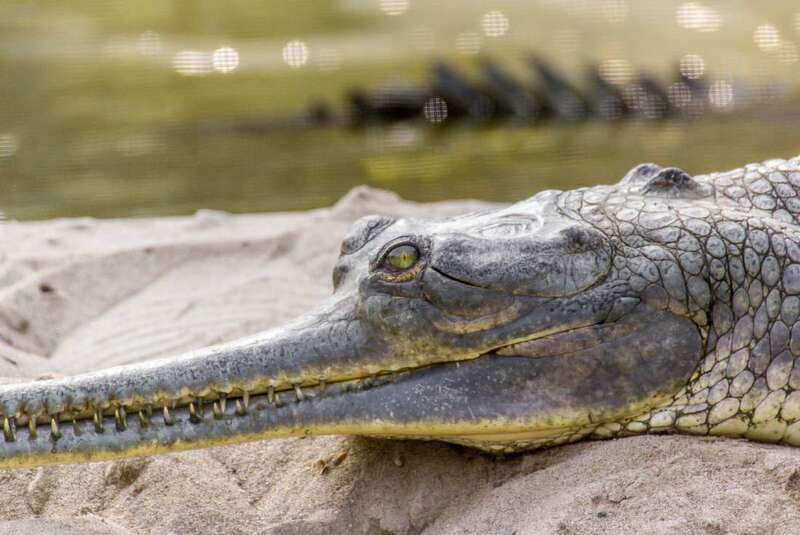 This fish-eating crocodile has long been hunted for the supposed aphrodisiac qualities of its snout. This evening, we will be staying overnight at the Intrepid Foundation’s project, the Madi Valley Homestay. This project provides sustainable incomes and encourages the communities living on the fringes of Chitwan National Park to conserve the wilderness and wildlife around them. On our arrival, the local men and women, dressed proudly in their traditional Magar attire, will be there to greet you and welcome you into their homes. In the evening enjoy a cultural performance by the locals where they demonstrate one of the oldest ethnic dance forms of the Magar community; the Maruni Naach. In the morning you will be given a guided village tour. After, try your luck fishing in one of the ponds around the village. Depending on weather and road conditions, you will also have the option to take a short drive to Baikunthe Tal where you can trek to a beautiful waterfall, sacred to the local people. After saying your goodbyes to your Madi Valley hosts, you’ll return to your lodge in Chitwan National Park via Twenty Thousand Lakes (Bis Hajaar Tal). Nepal’s second largest natural wetland, this beautiful reserve area is a maze of small lakes that teems with wildlife. Home to numerous crocodiles, this is one of the park’s best areas for birdwatching, with hundreds of species using it as a migratory route stop. If you’re lucky you might catch some more sights of the Indian rhino. Drop by the crocodile breeding centre on the way. Then there’ll be time to relax, or to take part in other optional activities offered by the park. Leave Chitwan this morning for your final stop in Nepal. Travel by private vehicle to the Nepalese border town of Lumbini (approximately 5 hours). This is no ordinary border town, but the birthplace of Gautama Buddha, the founder of Buddhism, and one of his four holy places of pilgrimage. It’s said in the Parinibbana Sutta that Buddha identified the sites as those of his birth, enlightenment, first discourse and death. You’ll visit the beautiful Ashoka Pillars and hop on cycle rickshaws to the Maya Devi Temple, the actual site where Lord Buddha is thought to have been born. Today it’s wave goodbye to Nepal and namaste to India as you cross the border. Though there’s always something to look at out the windows, it’s a good idea to have some other entertainment on hand for the long day of travelling ahead (approximately 8-10 hours by private vehicle including stops). You will cross at Sunauli and head for Varanasi. The change of scenery from Nepal to India is immediate. Enter Uttar Pradesh, India’s most populous state, and be greeted by cows ambling along the highway. 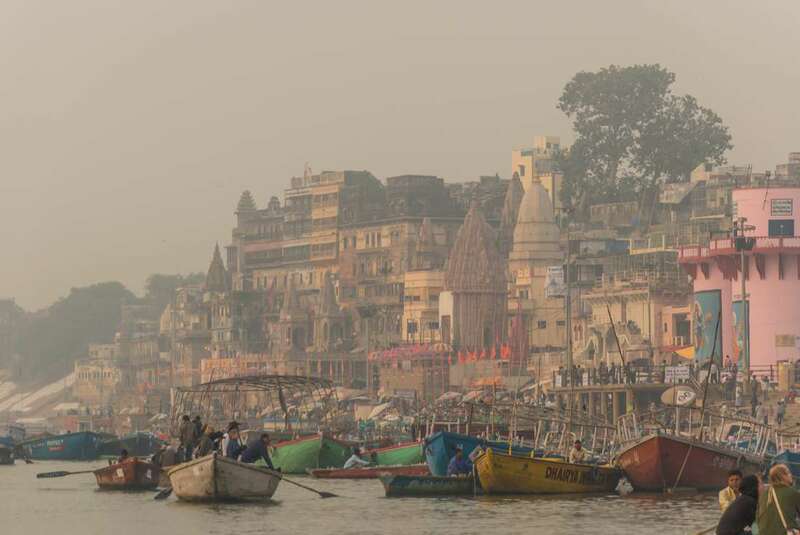 Varanasi is one of holiest cities in India and the ultimate destination for Hindu pilgrims who travel from far and wide to experience this spiritual city. Overflowing with temples, shrines and devotees, Varanasi might not be one of the world’s cleanest cities but there’s no doubt it’s one of the most amazing. Today you’ll experience the sacred River Ganges, lifeblood of millions of Indian people, with a boat trip through the heart of India. Transfer by small riverboats for our sailing trip (approximately 2 hours). A support crew will be on hand as you sail down this iconic waterway, passing village communities and viewing river life as it goes on around you. The boats are equipped with life jackets, the deck has mattresses and cushions to relax on, and it’s all covered with a cloth roof for sun protection. Arrive at your campsite and relax riverside, read a book or play some cricket. Watch the sun go down and eat a delicious vegetarian meal prepared by the boatmen. After your Ganges camping adventures, sail back in to Varanasi. Then set off by cycle rickshaw to visit the oldest part of the city, bustling with tourists and priests, and see different rituals being performed. Wander through the Old City with its maze of narrow alleyways packed full of small shops and stalls, and lumbering cows. 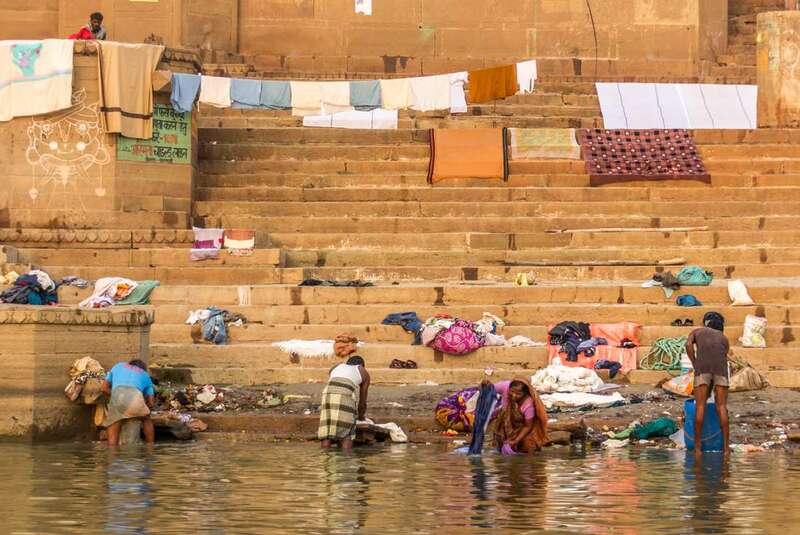 See pilgrims bathing and performing rituals and ceremonies unchanged for hundreds of years; temples full of bell chimes and the smell of incense; the dhobi wallahs and the burning ghats. There’s an option to take a trip to nearby Sarnath, one of the four main Buddhist pilgrimage destinations. The site is where Buddha preached his message of the path to enlightenment and features a number of stupas and museums to explore. Or perhaps visit Ram Nagar Fort, a crumbling 17th-century fort and palace on the eastern bank of the Ganges, that’s the ancestral home of the Maharaja of Banaras. This evening soak up the unique magical atmosphere of a candle flower ceremony as the sun sets. Today starts early with a sunrise boat ride on the Ganges, where you can watch the light gradually illuminate the many ghats and temples along the river as you pass. The rest of the day is free for you to spend as you like. You can explore the laneways and alleys behind the ghats, picking up some examples of the excellent local silk industry, or perfecting yoga in this most chakra-balancing of places. This evening you’ll board an overnight train for Jhansi, the nearest junction to Orchha (approximately 15 hours). Upon arrival in Jhansi, travel through traditional rural Indian landscapes to reach the beautiful town of Orchha on the banks of the Betwa River (approximately 45 minutes). Here you’ll have the opportunity to uncover a very different side of India. Initially a hunting area, Orchha has changed very little over the centuries. Despite its small size it is filled with many beautiful temples and palaces, built here in the 16th century by the ruling Bundelas clan. Here you’ll explore the palaces and temples scattered across the peaceful countryside on a walk. This evening witness the Ram Raja Temple puja (prayer) ceremony at the shrine at the heart of the city. Our accommodation here is a comfortable permanent camp tent. After breakfast you will visit the stunning Orchha Palace, built by Bir Sing Deo for his friend Jehangir, the great Mughal ruler. Take note of the grand Iwans (domes) that were built large enough to allow the movement of war elephants. You’ll also make a stop at Taragram, one of our Responsible Tourism projects. Taragram is a paper making factory that enables local tribal women to work outside the realm usually afforded to them. The paper is crafted from wood pulp and recycled clothing. Tonight you’ll get a closer experience of local flavours at a cooking demonstration with our local friends. Travel to Agra by train (approximately 5 hours) and head straight to the most recognisable sight in India. It doesn’t matter who you are, the Taj Mahal will exceed all your expectations with the morning light shimmering off its white marble surface. Best known as a monument to love and loss, the 17th-century Taj is a beautiful example of Mughal architecture, surrounded by trimmed English gardens. The highlights keep coming as you take a motorised rickshaw tour, a truly fun and Intrepid way to see the monuments of Agra. The city is also home to one of the finest looking forts in India. you’ll enter the dark red sandstone stronghold of Agra Fort – part fortress, part palace and part prison – and search through throne rooms and tiny but incredibly decorated mosques. Later, if you’ve got the energy, you can also visit Akbar’s Mausoleum – a beautiful sandstone and marble tomb built for the greatest of the Mughal emperors. An amazing local social enterprise, Sheroes Hangout, an initiative by the Stop Acid Attacks campaign and staffed by survivors, is located about 10 mins walk from the Taj Mahal and is an excellent place to stop for a cold drink, coffee or light meal while you are here. 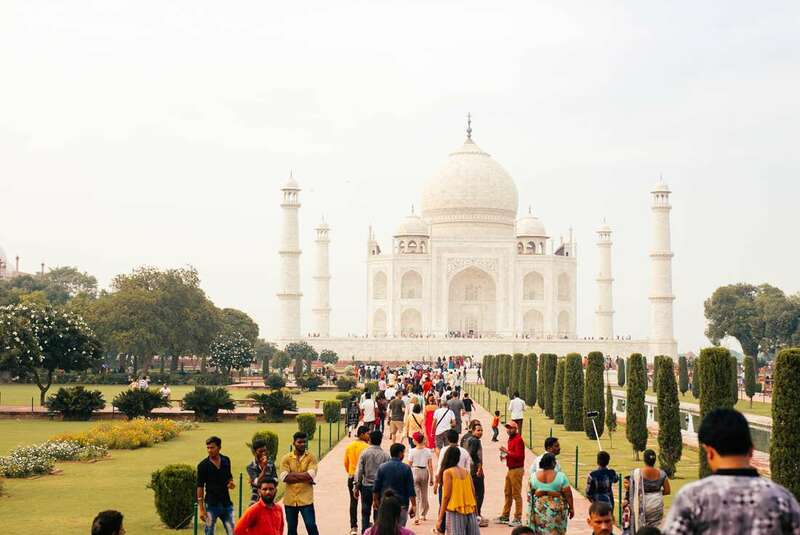 It’s back on the rails today as you take an express train to India’s capital (approximately 4 hours), sharing the journey with locals as the chai wallahs make their way down the carriages. 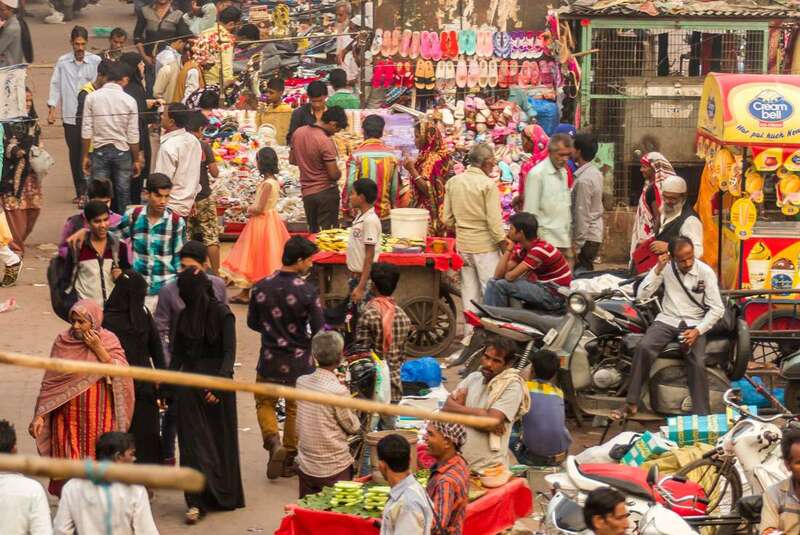 In Delhi, watch one of the world’s greatest shows unfold as people, traffic, cows and kids all work together in a kind of organised chaos around historical sites from different eras, museums and galleries, shops and endless bazaars. This is the place to grab a chai, put your feet up and let it all soak in. Make a visit to the Jama Masjid, Delhi’s oldest mosque and one of its most impressive buildings, or to the World Heritage-listed Mughal masterpiece of Humayun’s Tomb, the first garden tomb in India, built in 1570. You could wonder at the tall brick minaret of Qutub Minar, which was started all back in the 12th century, or explore the mighty Red Fort of Delhi. Part palace and part fort, it played an integral part in the history of the city with former residents ranging from royal families to British soldiers. Your adventure through India and Nepal ends after breakfast this morning and you’re free to leave the accommodation at any time. If you are staying on in Delhi a little bit longer an Urban Adventure is a perfect way to finish your time here.